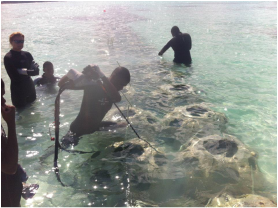 In 2014, a Reef Ball Foundation artificial coral reef project was established at Paradise Cove/Deadman's Reef on the island of Grand Bahama. This project has evolved into the largest contiguous Reef Ball reef in the entire Bahamian archipelago. 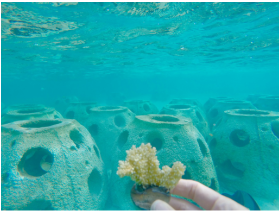 In addition to restoring the shoreline and acting as a breakwater, this growing reef acts as a living classroom where children come to learn, scientists come to study and tourists come to enjoy the abundance of sea life that surrounds this configuration of 300 Reef Balls. 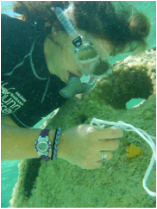 Cheri is actively involved in this project and involves local youths in ongoing fish and coral surveys, Reef Ball maintenance and educational snorkeling and field trips to the location. There following phases of this project have been completed. "Every moment of our lives we have opportunities to create positive memories for ourselves and for others. At the end of our human incarnation, our memories are all we have left of our lives. We can live each moment in mistrust, fear and despair or we can live in light, love, happiness and joy. It is up to each of us to decide which path we will choose."